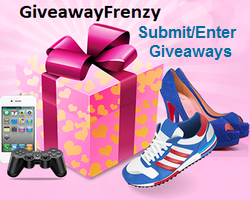 Here’s another great giveaway for all the gardeners out there! 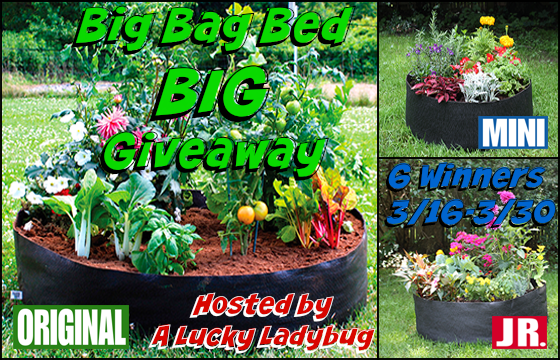 SIX lucky readers are going to win their very own Big Bag Bed to grow plants where they thought they couldn’t! The Big Bag Bed Fabric Raised Bed holds 13.7 cubic feet of mix and provides 13.5 square feet of growing space! I would get the original size and this would be for my best friend, she would probably grow some veggies. I’d get the Junior and plant annuals for some color in the back yard. I’d need the original size for growing my tomatoes. I would choose the original size for the garden. Tomotoes, lettuce and a few beans would fit nicely. I would choose the Original size of the Big Bag Bed. I love home grown tomatoes so I would use this bed to grow them in. I could place this bed in full sunlight so my tomatoes would grow well! I would love to get The Original Big Bag Bed. It would be wonderful to use this to grow all types of tomatoes. I believe we could use the orginal to grow all of our garden vegies!!! Would be much easier for two disabled folks. I would really like the original size to grow green beans and tomatoes with a little patch of strawberries. I would get the original. I would grow asparagus, cucumber, and melons. I would need the original. This seems like a great idea!